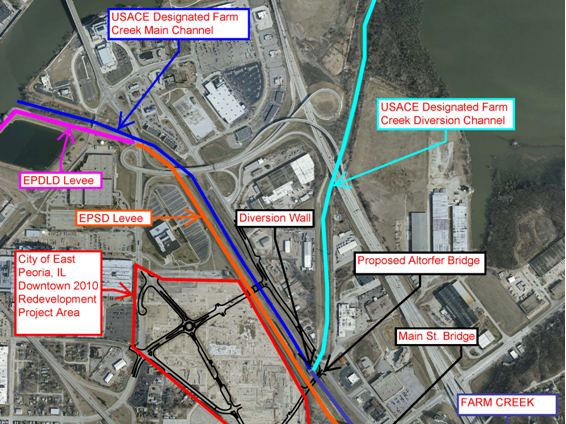 An existing HEC-RAS model of Farm Creek and Farm Creek Diversion channel in East Peoria, Illinois demonstrated that bridge piers from a proposed bridge just upstream of the diversion would not significantly alter the diversion of flow from the original design intent. 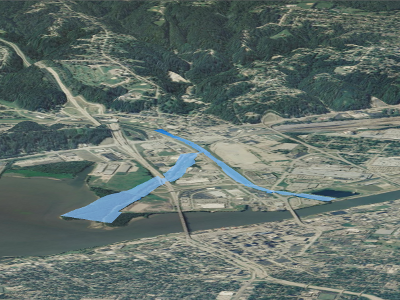 A 2D model of the site was requested to confirm these results and to analyze the impact of the bridge piers on design freeboard on the levee as well as other structures in the channel. Aquaveo developed an Adaptive Hydraulics (ADH) model of the site using SMS. The model was selected due to its stability and capability to address the 2-dimensional characteristics of the flow diversion, and due to the preference for this model by the US Army Corps of Engineers. 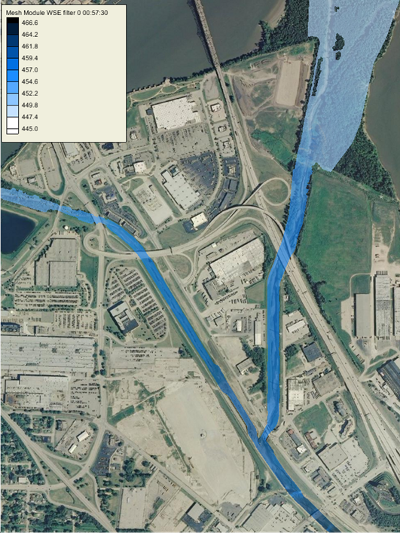 Several different flow conditions were analyzed, including one in which the downstream boundary was raised to the highest recorded stage to determine potential backwater effects at the diversion. The model served as a valuable test of the ADH interface, which had recently been added to SMS. It also served as an important trial run of the capabilities of the ADH model itself. Several models, including TUFLOW and RiverFlo2D were developed internally for comparison with the ADH model to validate model results.